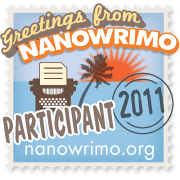 As some of you will no doubt already know, NaNoWriMo starts today. NaNoWriMo, for those currently baffled by that last sentence, is short for National Novel Writing Month, a challenge where people aim to write a 50k word novel during the month of November. This is my first year taking part. Hence I shall probably not be reading quite as much as I would normally do (which is variable anyway, but I digress). So for those of you eagerly awaiting a new review (very few, I know) they will be much scarcer this month. Sorry about that. In any case, wish me luck!